Surtaxed Netherlands stamps issued during the period from 1933 through 1936 included child welfare stamps, stamps depicting the Dutch royal family, and stamps honoring famous Dutchmen. The surtaxes on all these stamps were for children's charities and various public projects. 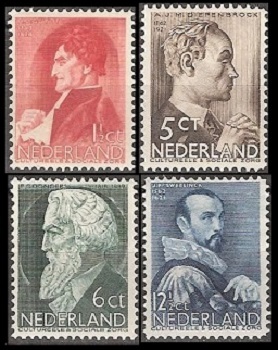 The four surtaxed Netherlands stamps shown above (NVPH #257-60, Sc. #B62-65) were issued on June 10, 1933 to benefit Sailors' Homes. 01 1/2 C. + 01 1/2 C. - Monument at Den Helder, dedicated to maritime rescuers. 05 C. + 03 C. - The Hope, a church and hospital ship. 06 C. + 04 C. - Lifeboat in a storm. 12 1/2 C. + 03 1/2 C. - Dutch sailor and a Sailors' Home. 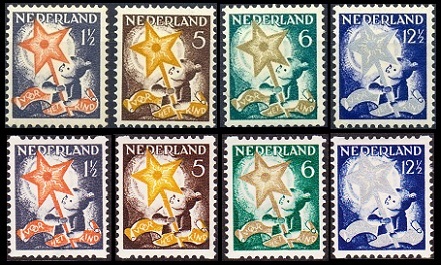 The surtaxed child welfare Netherlands stamps shown above (NVPH #261-64, #R98-101, Sc. #B66-69, #B66a-69a) were issued on December 11, 1933. In the manner of the definitive postage stamps of this time, these four stamps were issued both in sheet-format and in coil-format, with the coil stamps having syncopated perforations Type C. All of them are shown above. These were the last stamps to be issued in coil-format with syncopated perforations. The designs of these stamps feature a child carrying the Star of Hope, a symbol of Christmas cheer. The three surtaxed Netherlands stamps shown above (NVPH #265-66, #269, Sc. #B70-72) were issued during 1934. The 5 C. (+ 4 C.) denomination features a portrait of Queen Wilhelmina. The surtax on this stamp benefited the Anti-Depression Committee. The first 6 C. (+ 5 C.) denomination features a portrait of Princess Juliana. The surtax on this stamp also benefited the Anti-Depression Committee. The second 6 C. (+ 2 C.) denomination features a portrait of Queen Emma, the Consort of King William III and the Regent for Princess Wilhelmina until 1898. The surtax benefited the Fight Tuberculosis Society. The surtaxed child welfare Netherlands stamps shown above (NVPH #270-73, Sc. #B73-76) were issued on December 10, 1934. The design of these stamps features a poor child holding a doll. The four surtaxed Netherlands stamps shown above (NVPH #274-77, Sc. #B77-80) were issued on June 17, 1935. The surtax on these stamps benefited social and cultural projects. The 1 1/2 C. + 1 1/2 C. denomination features Henri Guyot (1753-1828), a pastor for the Walloon community of Groningen. He is famous for his work in educating the deaf, and he was the co-founder of the first institute for the deaf in the Netherlands. The 5 C. + 3 C. denomination features Alphonsus Diepenbrock (1862-1921), a Dutch composer, essayist, and classicist. The 6 C. + 4 C. denomination features Franciscus Donders (1818-1889), a noted Dutch Ophthalmologist and one of the primary founders of scientific ophthalmology. The 12 1/2 C. + 3 1/2 C. denomination features Jan Sweelinck (1562-1621), a noted Dutch composer, organist, and pedagogue. His works spanned the transitional period from the Renaissance to the Baroque Era. The surtaxed child welfare Netherlands stamps shown above (NVPH #279-82, Sc. #B82-85) were issued on December 4, 1935. The design of these stamps features a girl picking an apple. 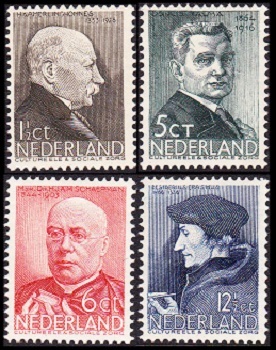 The four surtaxed Netherlands stamps shown above (NVPH #283-86, Sc. #B86-89) were issued on May 1, 1936. The surtax on these stamps benefited social and cultural projects. The 1 1/2 C. + 1 1/2 C. denomination features Heike Kammerligh Onnes (1853-1926), a Dutch physicist. He investigated how materials react when cooled to nearly absolute zero, and he succeeded in liquefying helium for the first time. The 5 C. + 3 C. denomination features Dr. Aritius Talma (1864-1916), a Dutch Reformed pastor, and later, a Dutch statesman. He spent his theological and political career working for the improvement of living conditions for the Dutch working classes. The 6 C. + 4 C. denomination features Hermanus Schaepman (1844-1903), a Dutch poet, Catholic priest, theologian, and politician. He was elected to the lower house of the States General in 1880. He is most remembered for using his political status to give a social and political presence to Dutch Catholics, who had basically been a disenfranchised minority, since the Dutch Protestant Reformation of the 16th Century. He later became a Franciscan and died in Rome, where he is buried. The 12 1/2 C. + 3 1/2 C. denomination features Desiderius Erasmus (1466-1536), also known as Erasmus of Rotterdam, was a Dutch Renaissance humanist, Catholic priest, social critic, and theologian. He was one of the few 15th Century Catholic theologians, during the time of the Protestant Reformation, that criticized the abuses within the Catholic Church and expressed the need for reforms within the Catholic Church. Over the centuries, he has been both praised and vilified by Protestants and Catholics, but today, he is revered as one of the greatest of the Reformation Era Dutch humanists. The surtaxed child welfare stamps shown above (NVPH #289-92, Sc. #B90-93) were issued on December 1, 1936. The design of these stamps features a cherub. The 6 C. + 4 C. denomination stamp shown above (NVPH #278, Sc. #B81) was issued on October 16, 1935 to benefit the National Aviation Fund. The design features a map of the Netherlands with the shadows of DC-3 aircraft flying overhead.